I am feeling in a kind of limbo between old life and new life, though things are moving forwards. Just a sample list of things that I have to do before I actually leave. Hopefully writing the list will help me remember to do these things! The list can be split into three sections. The top few are absolutely necessary for me to be in a good position when I finally get to NZ. I want to be able to teach while I am travelling, much better than all the other unskilled jobs that would otherwise be available to me, like bar work or packing vegetables. I have done enough of both of these jobs to last me a lifetime. Honestly I have probably spent a total of around five weeks working in a bar and/or picking fruit, and it was definitely too much! SO boring I can barely describe. However teaching is great fun. Despite the fact that I was hit with a surprise £400 bill to have my qualifications checked I think that it will be worth it in the end. An added bonus is that it puts me a few steps ahead in securing a perminant work visa if I have a skilled job already. The middle few bullet points are things that would be very helpful to have done before I go. I have a bunch of boxes of miscellaneous stuff that I have hoarded in my parents loft for the past few decades. Probably about a quarter of it is any good. Its off to a car boot and then charity shops. 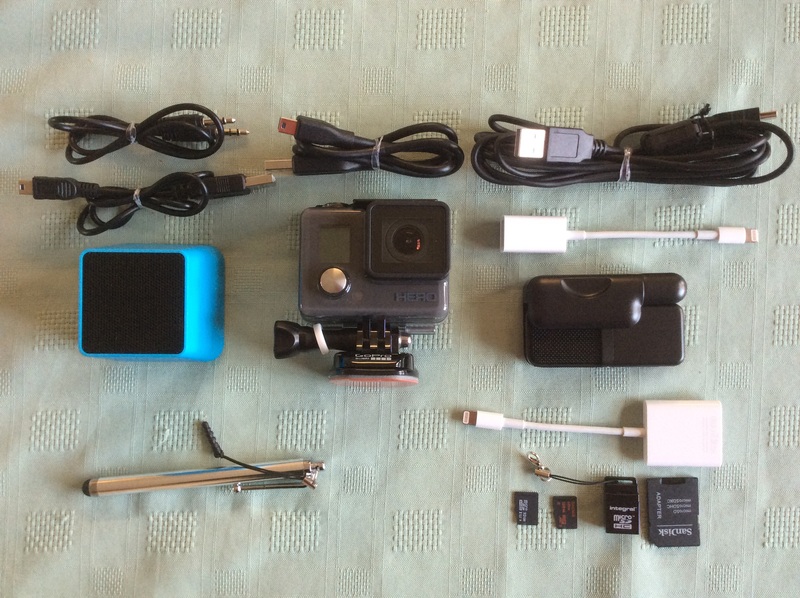 Something that I have enjoyed doing is getting everything I need to youtube and blog on-the-go. My basic kit that I have to work with is an iPad which imposes some limitations as it has not got as much easy versatility as a laptop or even a mac, however I wouldn’t change it for anything else. I don’t care what people say, for my needs its better than a computer. Here is a picture of my kit, excluding the iPad of course. Circling clockwise from the top we have: A surprisingly powerful speaker, a gopro hero, a USB powered external microphone, an SD adaptor and a selection of micro SD cards, and finally my drawing stylus. I got some waterproof tupperware to carry it all in. The gopro is ace, even my few little test videos just walking round the house look crisp, I cant wait to get it out on the water. Having said that I was frustrated because initially I could not get videos off the device and onto my ipad. I thought I was going to be stuck holding videos on the camera itself until I got to an internet cafe or something. Hardly ideal. The ipad camera cable does not work for this function for some stupid reason so I had to get the SD cable. I am sure this is all part of Apples cunning plan. Long story short I can now get videos onto my ipad. Three cheers for a small victory! There are still a few things missing from my ‘kit photo’. My ipad and wireless keyboard of course, but also a protable solar panel and waterproof battery! This type of gadget has to be the coolest thing I have seen in a long time. 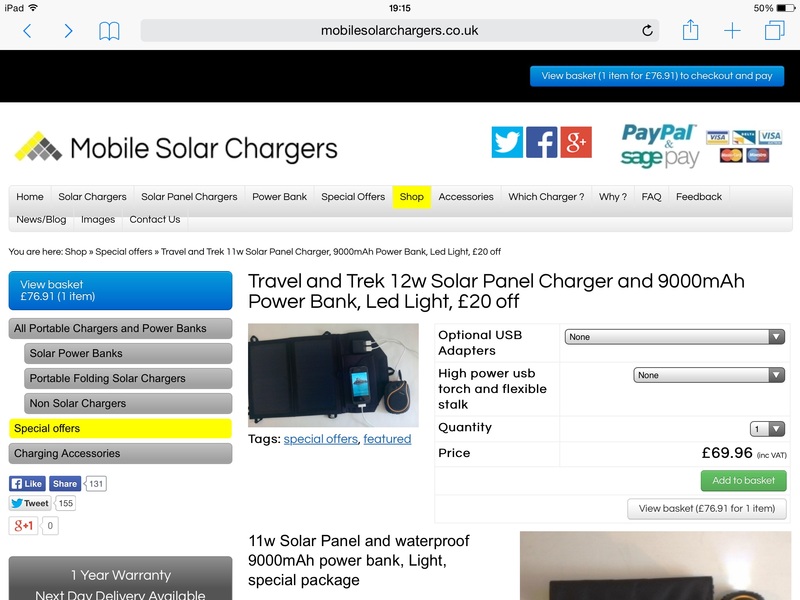 Check out mobilesolarchargers.co.uk or the picture below. It means that I can be completely self sufficient with my electronic devices no matter how long I am going to be spending in the wilderness or the ocean. No having to worry about my batteries running out, so I can write, draw and film to my hearts content!! Obviously I will need to get back to civilisation to get some internet to actually upload things, but still, an entire media centre that weighs less than 5kg, fits in a day bag, charges itself and is 100% portable is, in my opinion, amazing! I will no doubt make a video when I have everything packed. Its too tempting not to! Finally the last few items on the list are personal projects that would be really great to have pretty much done before I go. Unfortunately having to work all day does not lend itself to creative juice, so drawing is suffering a bit. Havent drawn in weeks and weeks. My book however is coming along nicely if a bit slowly. I want to have it for sale on itunes and kindle before I leave this hemisphere. I also have my last warhammer model to paint and sell. I started the conversion almost four years ago, started painting it two years ago and hopefully will get round to finishing it in the next six weeks. Looks like I will have to pull my finger out! Just the other day I received The Best News Ever, the New Zealand government has APPROVED my working holiday visa! I have a two year pass to enjoy New Zealand to its fullest! This last month has been minorly stressful because there was always that tiny chance that they would say ‘no’, then all of my boat building plans would have to find a new home. After my first blood test showed high creatine (an indicator of kidney failure) I had to go back for a second test. Luckily the cause of the abnormality was actually just my protein shake…. To celebrate, over the next few days I will upload the highly entertaining story of my last working holiday to Australia. Prepare for hijinks and near death experiences!